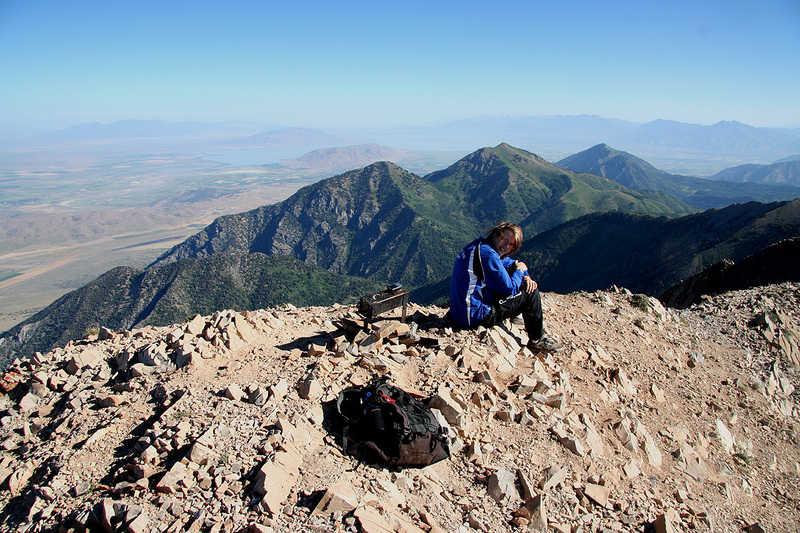 Route description: There are several routes, the one described here is probabely both the shortest and the easiest trail to Mount Nebo. From the trailhead, take the obvious trail that runs uphill on the right hand side of a fence. 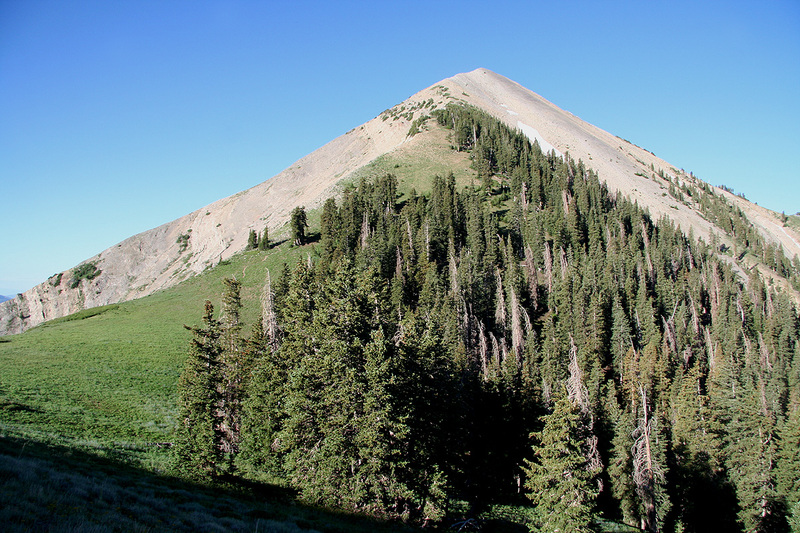 This trail will traverse the nice meadows above, then descend slightly in order to connect via the highest possible saddle, to the Nebo North Peak. 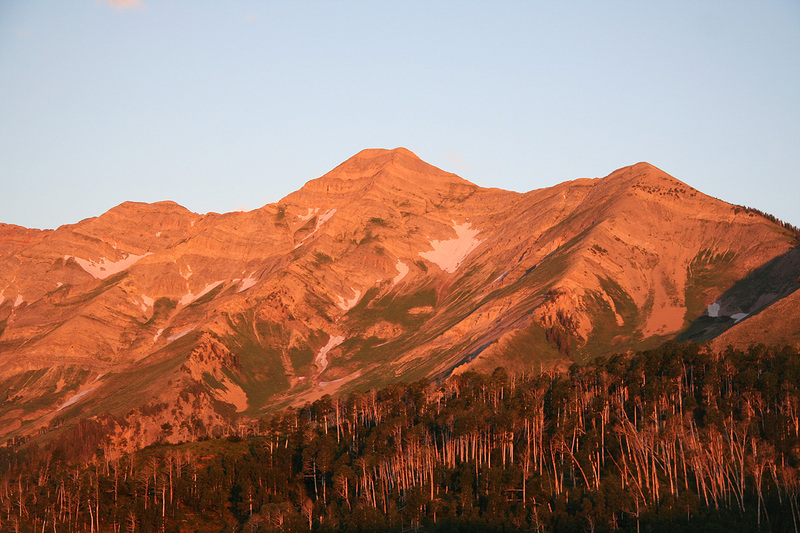 This peak dominates your view in the beginning. 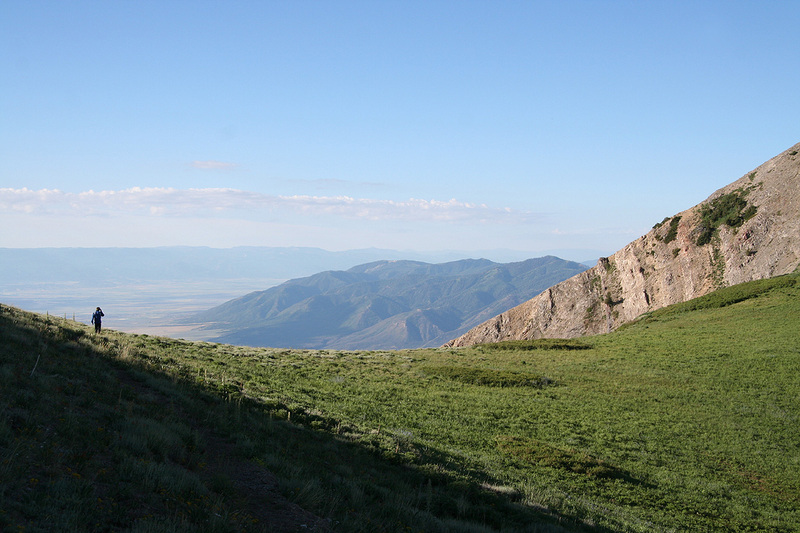 The main objective, Mount Nebo, is hidden behind it when approaching from this direction. 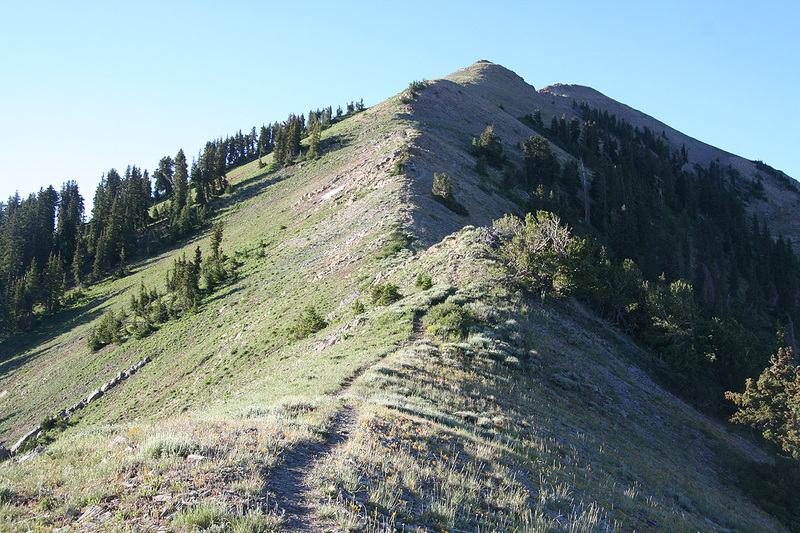 Next, the trail zig-zags up the hillside in order to reach the pretty distinct north ridge of the North Peak. 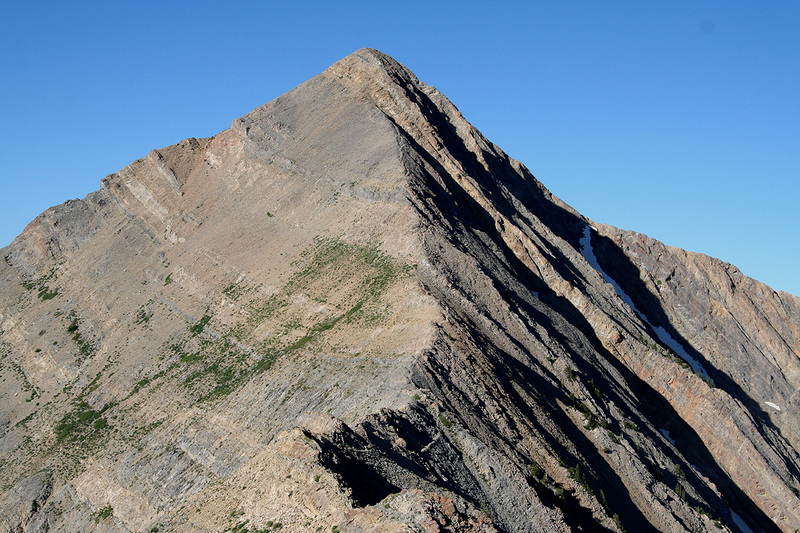 The trail initially climbs along this ridge, then leaves the ridge and traverses on the west side of Nebo North Peak, descending gently to the very broad saddle (called Wolf Pass) connecting the North Peak to the main Mount Nebo. 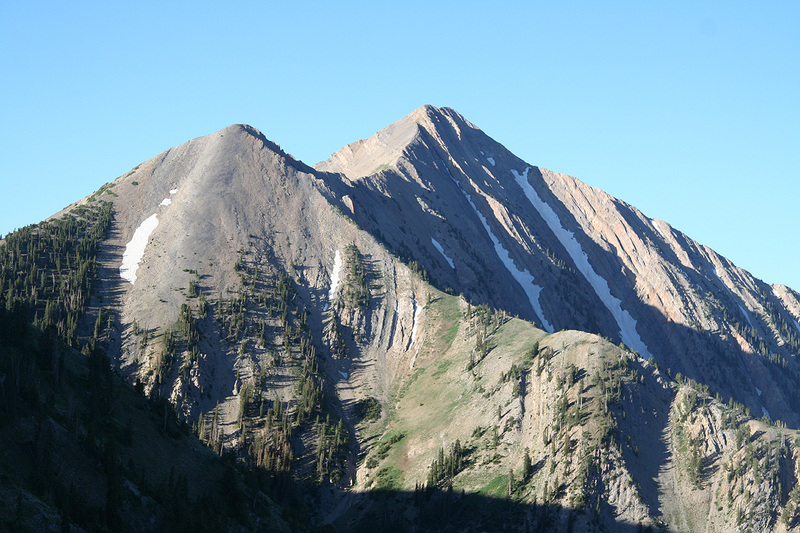 From this saddle, the trail climbs to the foresummit that you easily see from below. The route is (YDS) class 1 to this point. Arriving on this top, the route continues along the next fairly horizontal section before the final ascent along the ridge that connects to the main summit. Along this section, one can easily get into (YDS) class 3 terrain, however, by following the path of least resistance, the route remains at class 2+ all the way to the summit. I did this hike with my son Pål Jørgen. We drove up from Nephi and started out at 0645. 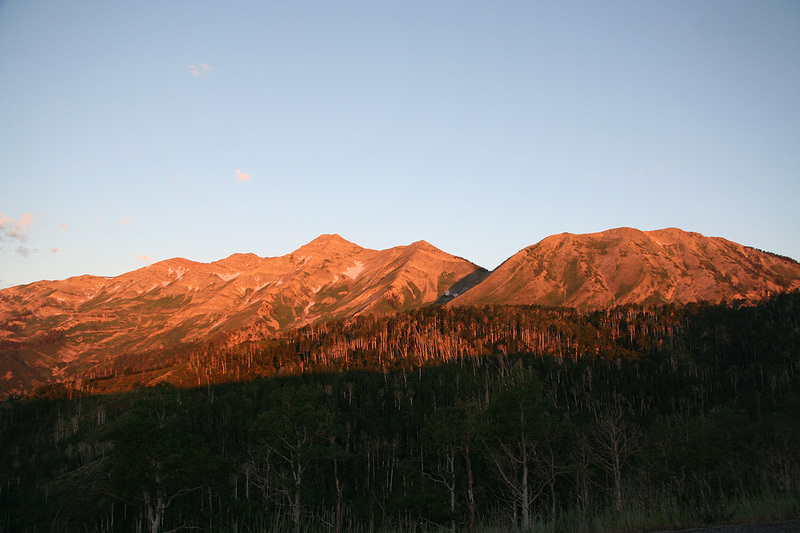 Daylight came while driving and the entire Nebo range glowed in the morning sun. 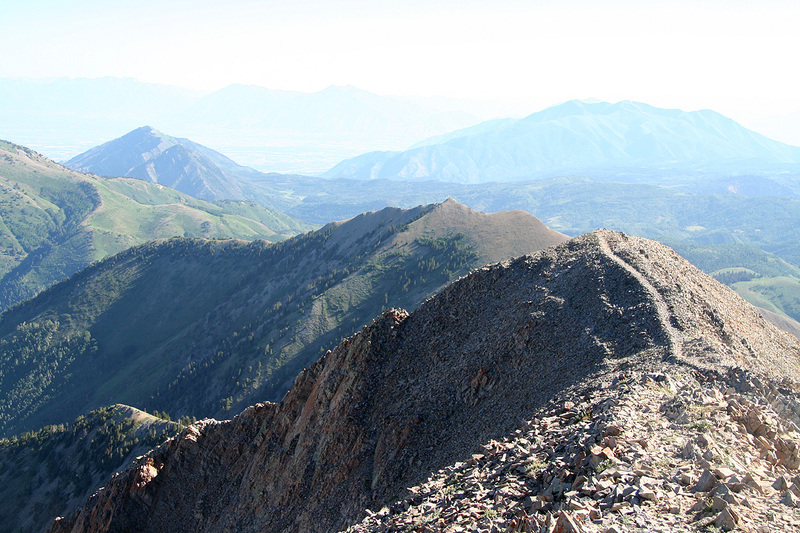 The trail was easy to follow and we reached the main (north) ridge of Nebo North Peak in about one hour. 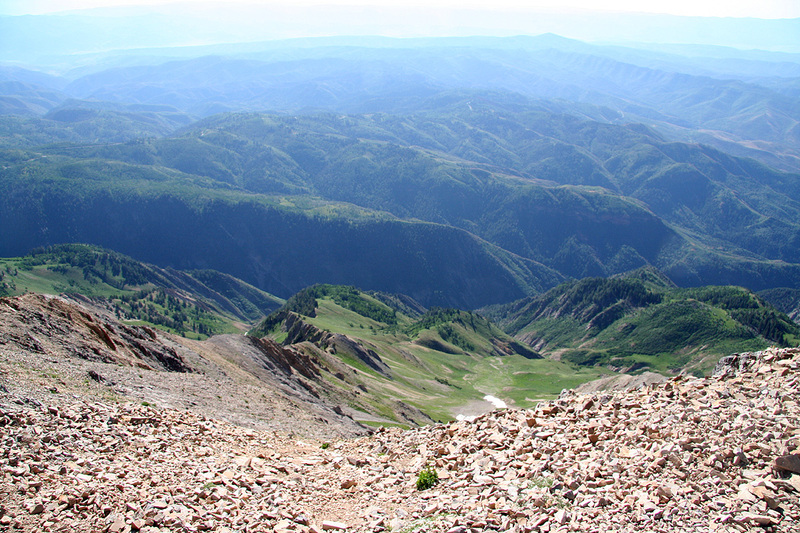 From here, for the first time one has a very good view of Mount Nebo as well as the small foresummit. As often is the case, the mountain looks somewhat harder than it really is. We wondered if the route would traverse the North Peak, but soon got the answer as we traversed the west side and arrived in Wolf Pass around 0815. Along this section, we had a pretty good view down to the flat area on the west side. From here, the trail ran nicely up to the foresummit. The connecting ridge was relatively flat, but the route changed from (YDS) class 1 into class 2, then class 2+. We reached the summit by 0910 and stayed for 30 minutes while enjoying the scenery all around. The trucks down on Interstate I-15 looked like small toy trucks, this peak really dominates the local area in a most impressive way. On the return hike, we decided to traverse across the North Peak. 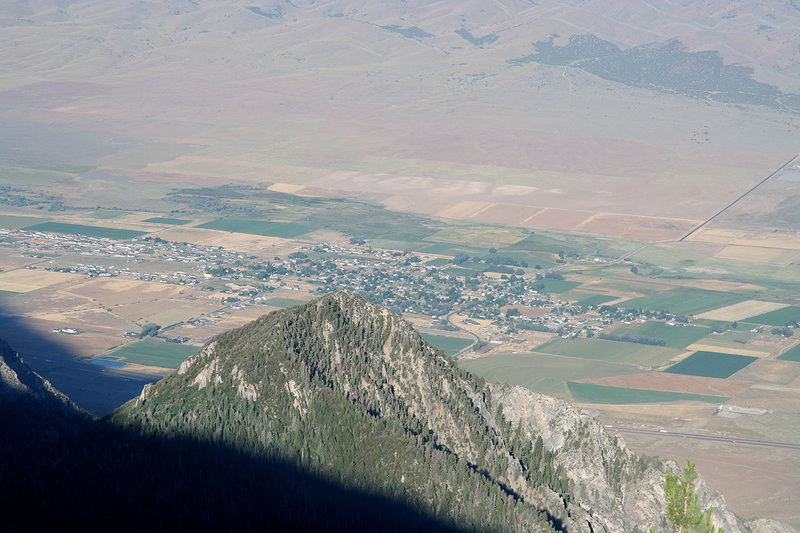 This climb is very nice and highly recommended. No difficulties whatsoever, the ascent from the Wolf Pass really defends a class 1 rating despite the lack of much trail. We were at the North Peak exactly 4 hours after leaving our car, one more hour brought us back to conclude a very nice trip on a very impressive mountain. 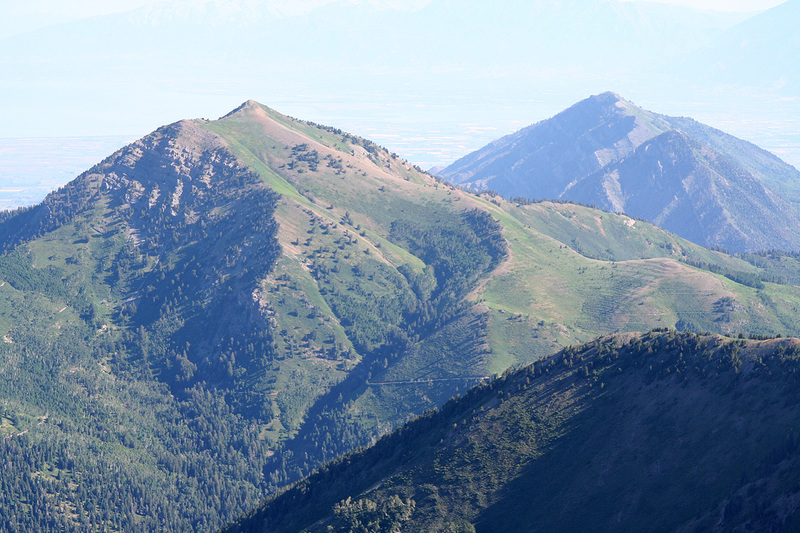 Mount Nebo, the south summit is left, the north (highest) is center and the Nebo North Peak is far right. The South Summit, Pål Jørgen scouts the route. 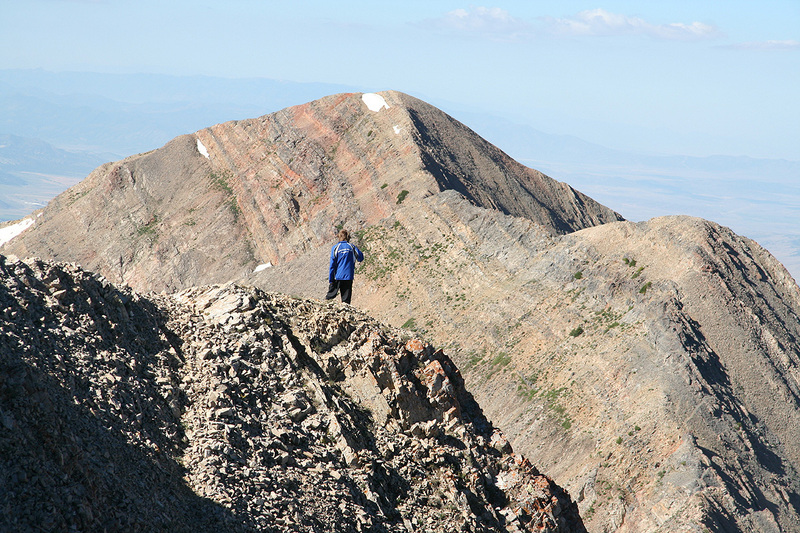 On the summit, the view is south. 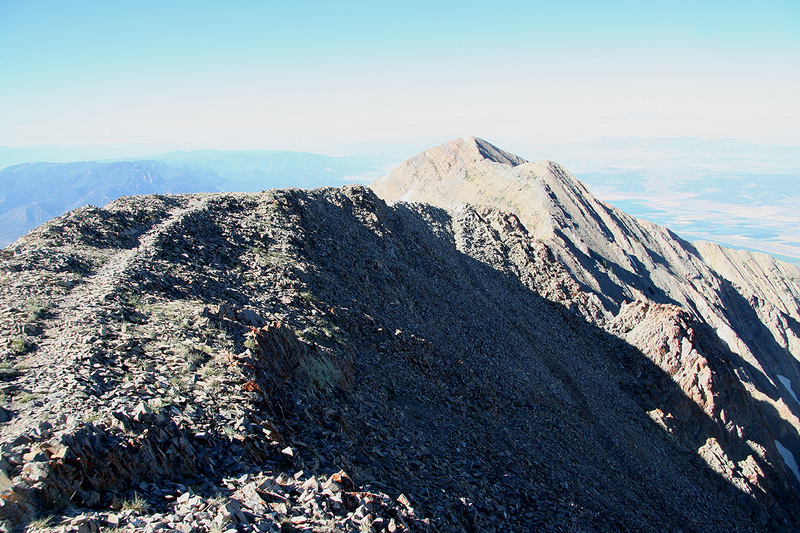 On the summit, the view is north. 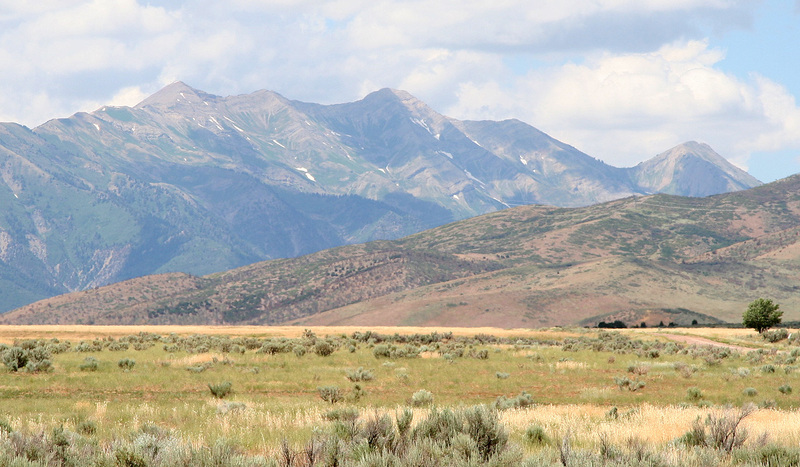 The Nebo North Peak looks much lower. View down to the east side. Summit View. The view is west, down on I-15. Summit Panorama. The view is north.